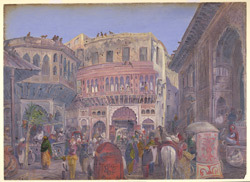 Oil painting on paper by Marianne North of a street scene at Mathura, dated 6th December 1878. Marianne North visited India in 1877-79 and completed over 200 paintings whilst there. In her autobiography, 'Recollections of a happy life' of 1892, she wrote, "Mathura seemed even odder and fresher on my second visit than it did at first, and I went every morning down to the ghat or street, among all the odd people, animals, and buildings, in my friend's carriage, working in peace and no hurry. I found a quiet niche quite on the edge of the ghat from which I could get a good view of the Suttee tower of red sandstone, covered with old carvings and live monkeys, and surrounded by picturesque buildings, with a pretty peep of the Jumna as its foot, plenty of people and sacred bulls...The street scene I painted also on the spot, sitting in the collector's carriage in the middle of a street as full of people as Bond Street in June! There was a perfect block of ekkahs, bullocks, camels, horses, and people."